Baked and Snack Foods, Beef Jerky, Candy and Confectionery, Cereal and Grain Products, Coffee/Tea, Cosmetics, Dairy Products, Dried Distillers Grain, Dried/ Dehydrated Products, Materials, Nuts/Dried Fruit, Pet Food, Plastics, Processed/Cured Meat, Sauces/Dressings, Seed Longevity, Spices, Tobacco. Originally designed for government inspectors, the 4-inch Pawkit is a reliable water activity instrument for use on-the-go. To make a measurement, flip back the sensor cover and fit the Pawkit over a standard AquaLab sample cup. A push of a button brings an accurate reading within five minutes. Pawkit owners include government inspectors, jerky manufacturers, small food companies, and production-line QA managers, among others. The Pawkit is accurate to ± 0.02 aw , so it can only be used where a higher accuracy is not critical. Baked and Snack Foods, Beef Jerky, Candy and Confectionery, Cereal and Grain Products, Coffee/Tea, Cosmetics, Dairy Products, Dried Distillers Grain, Dried/ Dehydrated Products, Materials, Nuts/Dried Fruit, Pet Food, Pharmaceuticals, Plastics, Processed/Cured Meat, Sauces/Dressings, Seed Longevity, Spices, Tobacco, Vegetable Oil. Measure water activity in 5 minutes or less ( average read time : 2.5 minutes ) with ±0.003 aw accuracy. AquaLab instruments are the fastest, most precise water activity meters available. 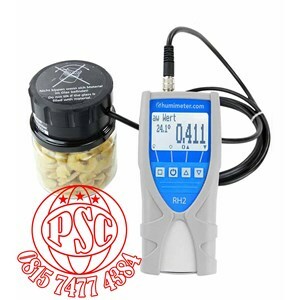 Water activity meters must report a temperature because water activity is temperature dependent. Internal temperature control lets you set a measuring temperature between 15º - 50°C and use the instrument anywhere-even outside the QC lab. Use the AquaLab Water Activity Meter 4TE to get lab-quality measurements at the line, receiving dock, processing plant, storage facility-anywhere you need to test and verify the safety and quality of your products and ingredients. 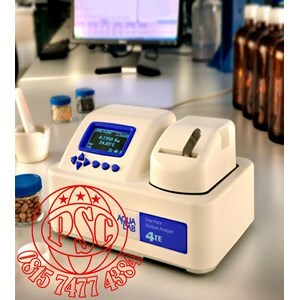 Put a 7.5 ml product sample in a disposable cup, place in the water activity meter, seal the sample chamber lid over the sample, and wait for vapor equilibrium. An infrared beam focused on a tiny mirror determines the precise dewpoint temperature of the sample. That dewpoint temperature is then translated into water activity. The sample chamber lid flips up so contaminated sensors are quick to spot and easy to clean. 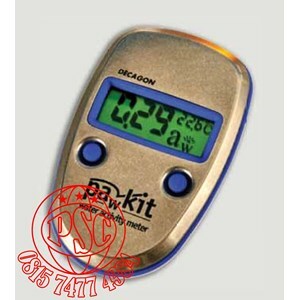 Anda Mencari "Water Activity Meter - Aw Meter"? Buat Permintaan Untuk "Water Activity Meter - Aw Meter"